Today on the Doc On The Run Podcast we’re talking about peroneal tendon subluxation in runners. Before we get started, I should mention there’s a video at the end of the show notes page that will show you how doctors diagnose this problem. The most common location for peroneal tendinitis in runners is probably behind the fibula bone at the outside of the ankle. The two peroneal tendons, both the peroneus longus and the peroneus brevis curve sharply around the back of the end of the fibula bone. As they make that turn around the ankle, it just makes sense that they could become irritated and inflamed as they glide around the back of the fibula bone. If the peroneal tendons flip back and forth, either across one another, or across the front edge of the fibula bone, that motion and the two peroneal tendons rubbing together can create a popping sensation, or even a clicking sound. 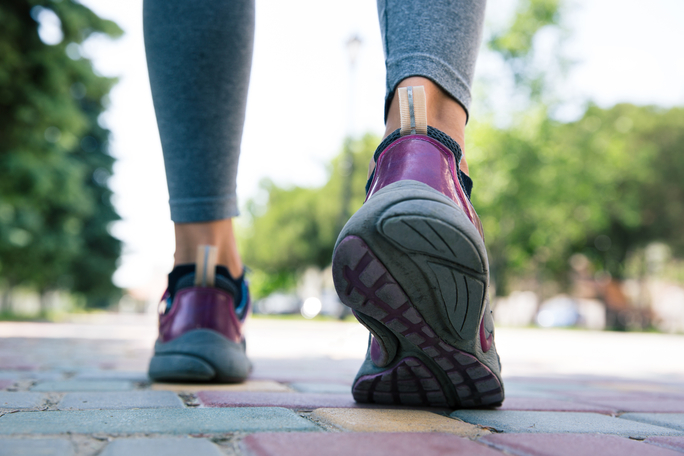 You may have searched for popping and clicking in the ankle and found an article on peroneal subluxation or peroneal dislocation. What is the difference between Peroneal Subluxation and Peroneal Dislocation? The dislocated finger is crooked. It may be bent at a weird angle. It is also painful and usually swollen because you have actually damaged the joint supporting structures. The dislocated joint is out of place, and it may stay that way unless a doctor puts it back in place. A subluxation is a lesser version of a dislocation. As a demonstration, take your index finger and point it straight out. Grab your index finger with your other hand. Hold it tightly, clenching your finger within your fist. Now pull on the finger. Subluxation is a small movement beyond the normal range of motion where something is moved out of its normal anatomic position. Peroneal dislocation is where the peroneal tendons flip all the way out of the groove behind the fibula and stay there. True dislocation of the peroneal tendons is fairly rare. Peroneal subluxation is the condition where the peroneal tendons pop back and forth within the groove, or they slide forward along the edge of the fibula, but then pop back into place. Peroneal subluxation is what most runners experience. To understand how peroneal subluxation happens, you have to understand the anatomy of the peroneal tendons. The one you actually care about if you are having popping and clicking and pain at the outside of the ankle is the superior peroneal retinaculum. This is the one that actually gets torn in patients who have severe ankle sprains and develop popping and clicking and/or swelling at the outside of the ankle. 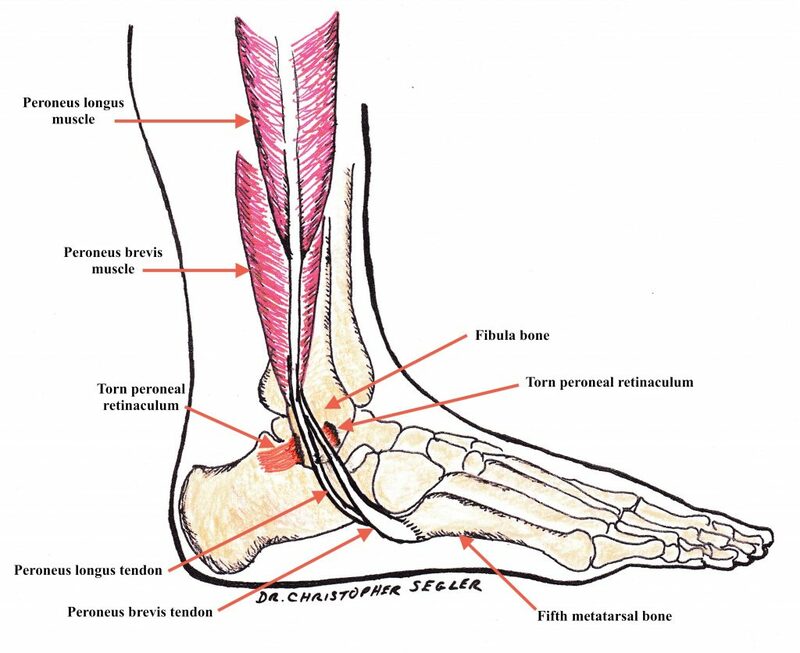 Both of the peroneal tendons at the outside of the ankle sit behind the fibula in a groove known as the “retromalleolar groove.” The superior peroneal retinaculum simply helps hold the tendons in the groove. There are a couple of different reasons why people can have peroneal tendons that pop and click at the end of the fibula at the ankle. The most common reason is that the ankle becomes injured such as in an ankle sprain. 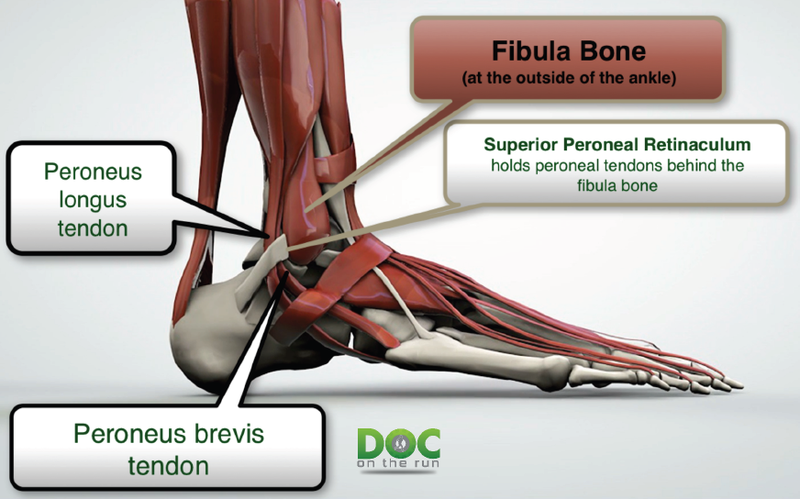 The peroneus brevis tendon starts at the peroneus brevis muscle on the outside of the leg and continues down the back of the leg, behind the fibula, before it curves around the end of the fibula and attaches to the base of the fifth metatarsal bone. This tendon is the only one that can actually fire and pull the foot back under the leg when you start to roll your ankle in the most common kind of ankle sprain. Sometimes when you roll your ankle, your peroneus brevis tendon attempts to pull the foot back under the leg so forcefully that the tendon will actually slide forward around the fibula and rip the superior peroneal retinaculum. Once the ankle sprain heals, one or both of the peroneal tendons can have a tendency to flip back and forth around the edge of the fibula. This condition is often referred to by physicians as peroneal subluxation or dislocating peroneal tendons. 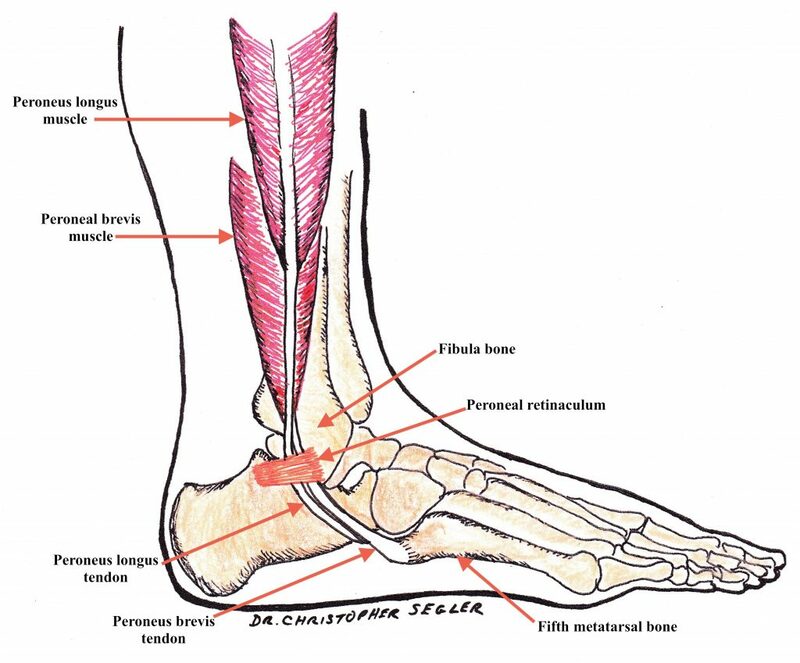 In Figure 1 you can see that the peroneal retinaculum is intact and holding the peroneal tendons behind the fibula bone in the retromalleolar groove at the outside of the ankle. Figure 2 illustrates a torn peroneal retinaculum allowing the peroneal tendons to slide forward and out of the retromalleolar groove. As the tendons slide back and forth around the edge of the fibula bone they make a popping clicking sound. Another less common cause of peroneal subluxation is related to the shape of the fibula bone itself. Sometimes the groove is not even present. Figure 3 is a cross-section through the leg at the level of the ankle. In this image there are three illustrations of different possible shapes of the fibula. 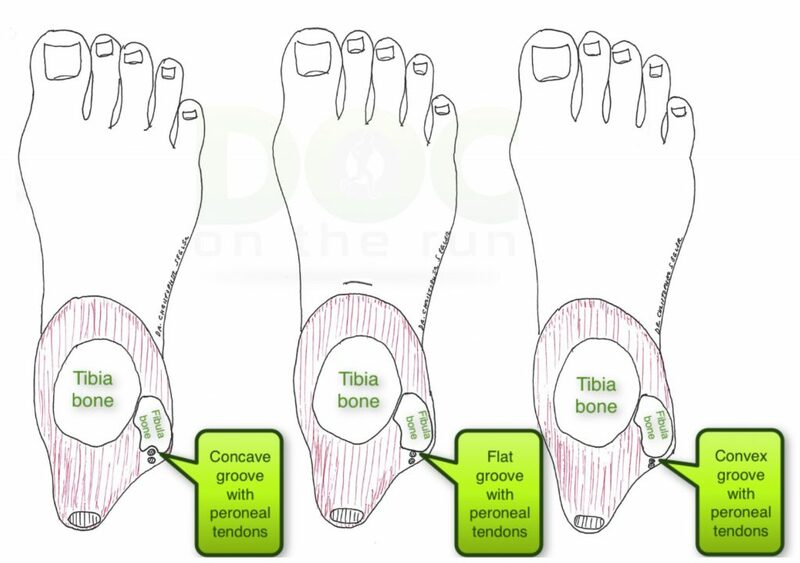 You can see that the 1st (most common) option is where the fibula groove is actually concave. This deep groove helps to hold the tendons in place because there is a natural depression in the back of the fibula bone. The 2nd option is where there is not much of a groove at all. And the 3rd option is where the back of the fibula bone is convex instead of concave. In both of the second two options it is possible that the peroneal tendons can flip back and forth across each other simply because there isn’t very much room between the bone and the peroneal retinaculum. The noise that you hear and sensation you feel is actually the tendons flipping back and forth across each other. This can cause pain and swelling. It can also cause chronic irritation of the tendons which might lead to splitting or tearing of the tendons. I have read articles written by doctors that frighten runners into thinking that any popping and clicking in the ankle is a problem that warrants some sort of surgery, crutches or other aggressive medical intervention. It is true that the tendons can just flip back and forth and make a popping and clicking sound. But it’s not always a problem. What I mean by that is that it may make noise, you may feel it but if it doesn’t cause pain, it may not be the problem that has to be corrected. My ankles have done that my whole life. Many years ago when I was in college, I was working in a climbing store. This guy Brent used to always tell me that I could never work for the FBI because I can ever sneak up on anybody. You could hear my ankle popping and clicking all the time walking around the store. Although my ankle does pop and click I do not get any pain when I run. It doesn’t swell. It doesn’t hurt. It’s not a problem. So if it’s not a problem, you don’t have to worry about it. That’s the main point. You have to remember that whatever the problem is you have to decide whether it’s a real problem or it’s just an annoyance. Alternatively however, if you have popping and clicking in the peroneal tendons and you get recurring peroneal tendon issues, you’re not doing something silly, you’re not running forty miles on sand or running a really unstable trails all the time or running on shoes are too unstable for you, but you have popping and clicking and you continue to get issues with the peroneal tendons, you could either have a torn peroneal tendon retinaculum (the band of tissue that holds the peroneal tendons behind the fibula). Or, you could have one of those oddly shaped fibula bones that just puts you more at risk of the peroneal tendons subluxing. You just have to be aware that but that the shape of the groove on the back of the fibula is not something you can fix easily. We can fix it with surgery, you don’t really want to do that if you’re a runner. There are some conservative treatments which might help the tendons to calm down and heal. But the surgery that is most often performed to treat these problems involves surgical reconstruction of the peroneal retinaculum and surgical deepening of the groove at the back of the fibula. Why you don’t want surgery if you are a runner? I think it’s true dislocating or pathologic subluxing peroneal tendons are very rare. However, if you go to an orthopedic surgeon and you tell him you have popping and clicking, and if you had any history of problems on the outside of your ankle, he is likely to recommend surgery to fix it. There are two ways to do this surgery to change the shape of the back of the fibula. One way is that the “old school” way, which is terrible for runners! The surgeon actually surgically opens the ankle. The surgeon will pull the peroneal tendons out of the way. On the back of the ankle the surgeon will actually take an osteotome (which is a fancy word for chisel) and slice into the bone on the back of the fibula in approximately the width of the peroneal tendons. The surgeon basically just takes the chisel and taps into the bone and it cuts into the bone. Next the surgeon takes a “bone tamp” which is a metal instrument about the size and shape of a pencil. The surgeon lays the bone tamp right there on the back of the fibula between the two chisel slices in the bone. When he hits the metal bone tamp with a hammer it caves the back of the fibula in. That depression makes a deeper groove for the peroneal tendons. The problem is it that the bone also bleeds. So then you get scar tissue between the tendons and the back of the fibula bone, which causes another problem. The better way to do it is to actually take the tendons out of the way and place a drill into the end of the fibula (where the tendons aren’t touching the bone). Then basically by holding the drill bit underneath the bone we can spin the drill bit, moving it up and down behind the area where the tendons sit on the back of the fibula. This method keeps the covering of the bone intact. If you keep the covering of the bone intact you don’t getting scarring between the tendons and the bone. As we spin the drill bit under the surface of the bone, we can see the drill bit through the bone because the bone is opaque as the drill bit gets close to the surface of the bone. The surgeon just has to make sure not to carve away too much bone and inadvertently poke the drill bit through the surface of the bone. So basically we kind of grind the bone away to soften the back of the fibula bone. Then we put a bone tamp in there. We push it in so it makes a concavity but it doesn’t disrupt the surface. And you don’t get as much scarring that could cause problems. However, even though I think the second option is better, it is still surgery. Anytime you have surgery, you’re going to get scar tissue between the two tendons, even if we don’t get scar tissue between the bone of the tendons when you put them back in the groove and we sew the retinaculum back together. You really don’t want scar tissue between the two tendons. As a runner, you want to avoid surgery for sure! 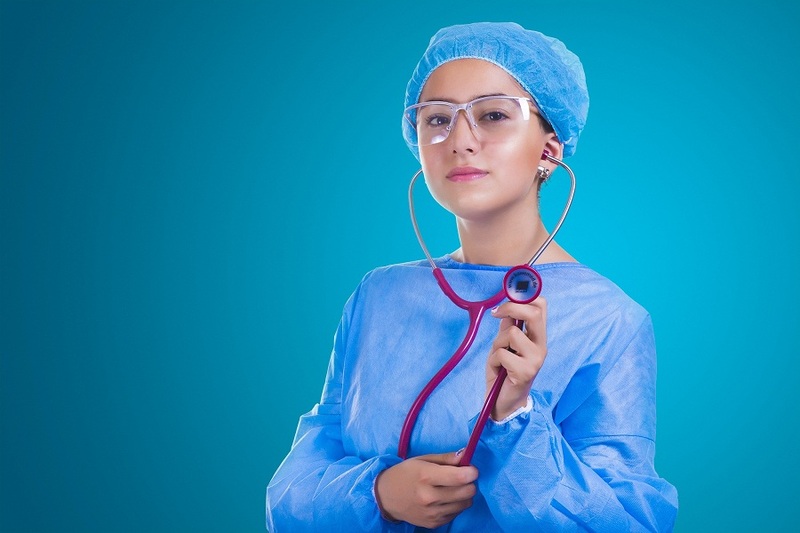 Of course, some doctors will commonly recommend surgery because it seems like a simple fix. All they have to hear is “pain, popping, clicking,” and that’s it… they think you should have some kind of surgery to fix it. So I would not recommend it if any other option might help. 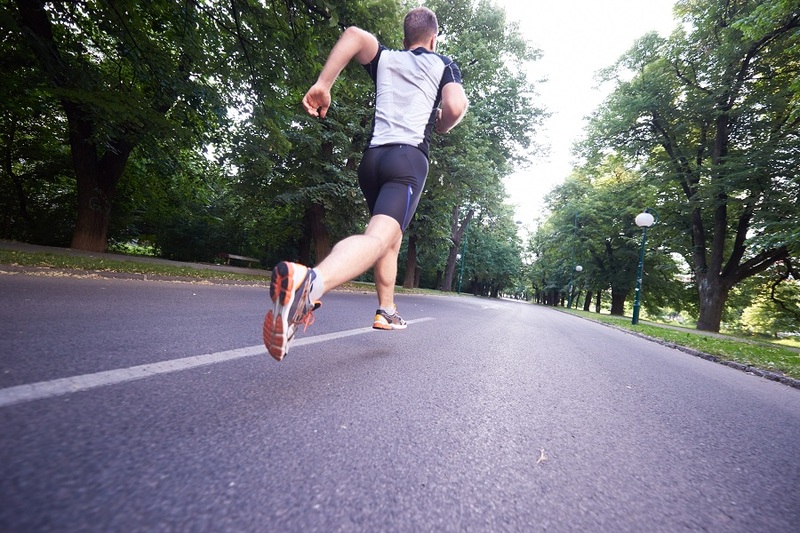 If you are a runner with peroneal subluxation you may have one of several problems. A fibular groove that is just prone to subluxing peroneal tendons. The most concerning situation for a runner is pain. If you have a popping, clicking sensation and pain and swelling on the outside of the ankle, it probably means the tendons are truly irritated and inflamed. Chronic inflammation of the peroneal tendons can permanently damage them. Chronic inflammatory fluid contains degradative enzymes. Degradative enzymes degrade, or break tissue down. The degradative enzymes do have a useful function. They are supposed to break down teeny little bit of tissue debris after you have an injury. Degradative enzymes are supposed to help clean up the mess. But when you get popping and clicking in the ankle because the peroneal tendons are flipping around so much they become irritated and cause an inflammatory response, you get a problem. The ankle swells, the inflammatory fluid gets trapped within the swollen tendon sheath surrounding the peroneal tendons, and the degradative enzymes actually start to break down the collagen in the peroneal tendons themselves. I have actually had to do surgery on runners to repair splits and tears in the peroneal tendons that developed from this chronic inflammatory cycle. 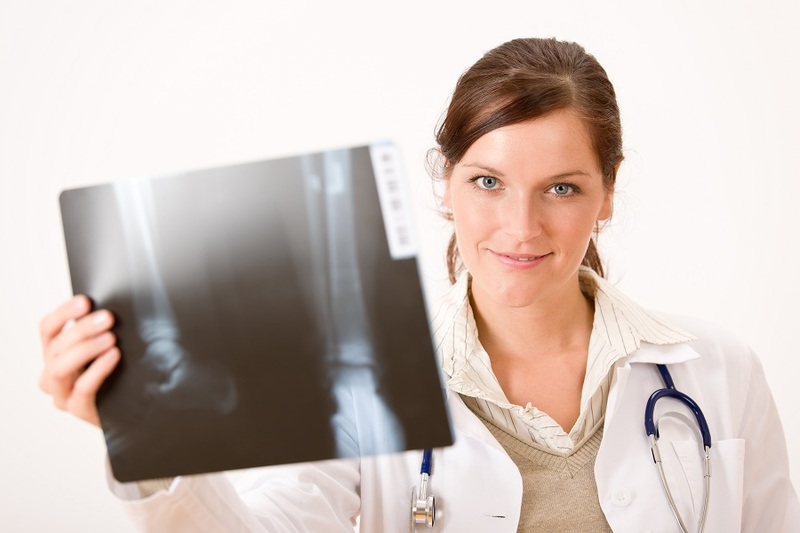 The way doctors diagnose peroneal subluxation is easy to do yourself. All we have you do is move your foot back forth, alternating from supination to pronation. If you go to the bottom of the show notes page for this episode you can access the video that will show you exactly how doctors check for subluxing peroneal tendons. Sit on the bed with your foot an ankle just off the edge of the bed so your foot is in the air and your heel is not touching the bed. Point your foot downward (plantar-flexing) and toward to other foot (inverting). This position is supination. Now rapidly move your foot outward, away from your other foot, and upward (dorsiflexing). Repeat this movement rapidly several times. If you hear popping and clicking you may have subluxing peroneal tendons. Look at the outside of the ankle and observe the peroneal tendons. You will probably see one or both of the tendons bowstringing and protruding at the outside of the ankle from behind the fibula bone. If the tendons appear to be flipping forward, or protruding out of the groove behind the fibula, that is what doctors would diagnose as subluxing peroneal tendons. The Superior Peroneal Retinaculum is one of the bands of tissue that helps hold the peroneal tendons in place behind the fibula bone. It is like a ligament. When you look at the retinaculum in surgery, it looks like strapping tape. Like strapping tape, the retinaculum is very strong. It doesn’t usually just rip or tear. It is so strong that much of the time when it “tears” the retinaculum rips-off a small wafer of bone instead of tearing. Technically this is an avulsion fracture. “Avulsion” is just the medical term for rip off. If you get an x-ray of the ankle you may see a little thin white line on the outside of the ankle revealing that avulsed piece of bone where the retinaculum ripped away from the fibula bone. If you have a small fracture of the lateral process of the talus, it can masquerade as subluxing peroneal tendons. The lateral process of the talus bone sits right under the peroneal tendons. If you roll your ankle and chip off a piece of that bone it can move around and cause popping, clicking, pain and swelling on the outside of the ankle. You may be able to see this fracture on x-ray. If it just started and you rolled your ankle, you probably need x-rays. If you are in Texas or California, I can even order those for you and review them through a Virtual Doctor Visit. If it’s painful, and especially if it’s swollen, reduce the inflammation. Just go back to the lesson on Peroneal Tenosynovitis and do all of the treatments we discuss there to reduce peroneal inflammation. Try to run in a way that supinates the foot. Try shoe inserts that hold your foot in a supinated position. You can even try taping the ankle to reinforce the retinaculum and help hold to the tendons in place. But if the ankle keeps popping, clicking, and swelling…don’t ignore it! Talk to an expert and figure out how you can get it to calm back down so you can keep running. If you aren’t sure about whether or not you have subluxing peroneal tendons, just go to the bottom of the show notes page for this episode you can access the video showing exactly how doctors check for subluxing peroneal tendons.